Six-word recap: Suffered through heat, finished with friends. 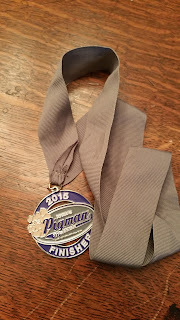 After Steelhead, I tried to take recovery a little more seriously to get myself ready for my next challenge--Pigman Half-Ironman a week later. Of course I did indulge a little bit with dill pickle chips and mountain dew but I also foam rolled and wore compression socks the next day at work. Low-key workouts and sleeping were the key for me. I road my bike twice--on Monday and Saturday, swam once, and didn't run at all. On Friday night, Matt and I headed back to Iowa. We found a great deal on a hitch bike rack for Matt's car on Craigslist so after we got that set up we were on our way. On Saturday morning, we headed out for a short shakeout bike ride and on our way back about 3 miles from town, I dropped my chain. This isn't the first time I've dropped the chain on this bike, but it hasn't happened since I got a new chain after switching out my front chain ring last year before Ironman Wisconsin. This time, however, I dropped it and caught it between my small chain ring and my frame and locked up my pedals. My dad had to come get us in the car! I was a little worried that I wasn't going to get my bike fixed in time for the race but I am grateful that this incident didn't occur during the race because that would have meant a DNF. After a quick lunch, we took my bike into Free Flight in Dubuque and they were able to put a new chain on it now problem. Thankfully my derailleur survived the incident just fine because that would have been a little more expensive repair. After the bike situation got all sorted out, we headed to Cedar Rapids to our hotel and packet pickup. We left a little later than planned due to the bike chain incident, but Pigman has race-day packet pickup so we weren't rushed. We arrived at the hotel around 5:45 so we did have time to swing by packet pickup before it closed at 6. Pigman is most definitely a no frills race and packet pickup follows suit. We walked in picked up our race numbers and bags and our t-shirts. This year we received long sleeve tech tees. In our race bags, we got several sample sizes of deodorant, chapstick, and a few random snacks. We had an early dinner at Biaggi's and I downed plenty of bread in the name of #carbloading. Then proceeded to top those carbs off with more carbs in the liquid form. We went on a little beer searching adventure to HyVee and I tried some Toppling Goliath. Since I signed up for Ironman Steelhead 70.3 in late 2014, I wasn't planning on also racing Pigman a week later, but I am a sucker for peer pressure. On January 4, after a few drinks, Kelly talked me into signing up. I think I was still on the post Ironman high (and definitely still on the post Ironman workout slump) so this sounded like a great idea. We actually signed up at the same time so our numbers were right next to each other! My friends Brent and Laura also ended up signing up to so it was definitely a social race for me. The game plan was to race Steelhead and then just take it easy at Pigman and since getting a PR at Steelhead, I was content with that plan. Sunday morning, we loaded up the car and headed out to Pleasant Creek State Park for the race. This race is small so finding parking and getting good spot in transition is no problem. Transition spots are not assigned per race number but rather age groups have a one or a few racks. There was plenty of room at the rack I choose to set out all my stuff. I took my time hitting up the bathrooms, eating breakfast and putting sunscreen on before race start. The race starts at 7:30 and is a time trial start. My age group was estimated to start around 7:40 am and we walked down to the beach around 7:15. Unlike at Steelhead, this time I made sure to get in the water prior to the race! The water temperature was just over the wetsuit cutoff but competitors we allowed to wear wetsuits but then were not eligible for awards. I was happy to skip the wetsuit. Right after the race started, I realized I forgot my heart rate monitor in the car so I walked back up to get it with plenty of time to spare. This year, Pigman changed the course to make it more spectator friendly. The new swim course looked like this. On the way out, we swam with the buoys on our right, made a U-turn about halfway through and continued with the buoys on our right. There was a only one line of buoys in the middle and in general, most triathletes are terrible sighters in open-water...me included. So there was a lot of crossing over into other swimmers. Thankfully my swim felt really great and I felt like I was moving smooth. I was a little disappointed in my overall time (39:27) because I really want to do a sub-37 swim but I will get there. Transition went well and I headed out on the bike. The bike this year was a 4-loop course with two significant climbs on each loop. And the "loop" was actually an out and back so we made eight 180 degree turns throughout the course. The loop had one aid station so we passed through that 4 times throughout the day; it had water and the sports drink was Advocare. I tried a bottle and thought it tasted like fake sugar so I avoided it for the rest of the race and depended upon Honey Stinger Waffles, Bonk Breaker bars, and Clif Shot Gels to get me through. Plus I stuck with my BASE Salt from Steelhead. I could already tell the weather was getting warm on the bike so I wanted to stay on top of hydration. To be honest, the bike course was totally boring. Plus it was open to traffic and there were way too many cars for my liking with bikers on both sides of the road. My boost every lap was seeing Laura, Kelly, and Brent. Plus Matt showed up about halfway through the bike and took some pictures. And one of my old college roommates-Angie-was out cheering on the course so I got to see her as well. Smiling but thinking "I wish this was over"
My bike splits were staying fairly consistent, but my heart rate was spiking quite high on the hills. I could tell that I was not really recovered from the race the previous weekend. By the time I hit 56 miles I was really ready to be off the bike. I transitioned quickly off the bike and grabbed my visor and my handheld. At both of the other half Ironmans this summer, I've just been able to rely on the aid stations to get hydration and stay cool but because I knew the temperatures were likely to get into the high 80s and low 90s, I wanted my handheld for between the aid stations. As soon as I started running, it felt hot. I stuck with the normal run 1 mile, walk 30 seconds intervals I've had success with. The run course was again a 4-loop course consisting of a 3.25 mile loop through the campground of the park. Most of the course was unshaded though the course was mostly flat. Each loop had 2 aid stations but due to the heat, that really did not feel like enough and I was so thankful to have my handheld. I was dumping water over my head from the beginning. Unfortunately the water station volunteers on the run were really not prepared. Let me be clear, I am in no way slamming the volunteers. I realize that they volunteered their time and were also probably feeling miserable in the heat and were very overwhelmed by the needs of the runners. I feel like the race organizers were not meeting our needs here. One aid station quickly ran out of ice plus I don't think they realized that participants would want just cups of ice. Plus with a 4-loop course and about 400 people participating in the race, about 123 people were in a given mile on the course. That number is based on a lot of assumptions, but let's just go with it for a minute. The aid stations were not staffed for those kinds of numbers. By my third loop of the run, Matt had joined the volunteers at an aid station because they could not keep up with filling the cups. In the future, the race organizers definitely need to have more volunteers at each aid station plus more instruction for how to set up the aid station and MORE ICE! I do have to say the volunteers were very cheerful and they would take my handheld and fill it up for me! I was definitely slowing down in the later laps of the run and walking a lot more. On the last lap, Kelly and Brent caught up to me and we ran together to the finish. The highlight was getting really great finish line photos from Matt. Both of my feet are off the ground! And the race captured a great finish line video. We are at about the 2:39:10 mark. I went right to the water tent after the finish line and let the cold water drip on my neck. Overall, I was not really happy about the new Pigman course. I can definitely understand the benefits of going to a 4 loop bike and run course--fewer volunteers needed, fewer aid stations, fewer road blocks, and spectators do see more of the race. But I really did not like the 180 degree turns on the bike or that the course was open to traffic. The run course could have used one more aid station but I did enjoy that there was no huge hill like the previous course. 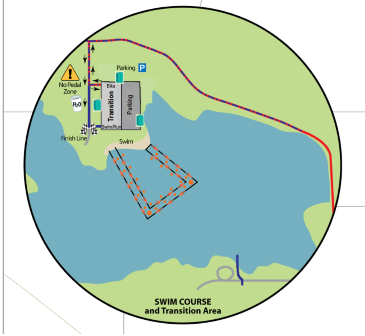 I love that this is a local race and the time-trial swim start is my favorite. Plus it is the cheapest half Ironman I have ever found! But I likely won't be doing this race again unless they change the bike course. I will not complain about the heat because it's a race in August and I don't sign up for those expecting beautiful cool weather, but more water and ice are necessary for hot races. I'm calling the half Ironman double a success though I don't know that I would do it again.